If you like home cookin', the best Chattanooga restaurant you will come across isn't in Chattanooga. It's a short 30 minute drive north to Dunlap Tennessee. The Cookie Jar Cafe is quite a surprise out in the middle of nowhere in Dunlap Tennessee. If you aren't looking for it, and I mean looking carefully, you won't find it. 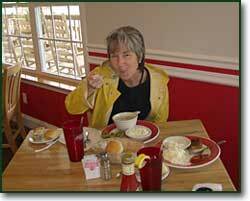 But when you do find it you're going to be treated to some of the finest country cookin' you ever did taste. Everything in the Cookie Jar Cafe is home made, including the huge desserts. Well, the size of the desserts at the Cookie Jar Cafe were no match for the sliver of cake we had in Gatlinburg. I wish I could have had more than one dessert since they all looked so delicious. I guess we'll have to stop in next time we're in Dunlap for a different dessert. So why is this outside of Chattanooga restaurant called the Cookie Jar Cafe? Well, I'm sure the Cookie Jar Cafe has one of the biggest cookie jar collections in central Tennessee. Just look at the cookie jars lining the walls of the restaurant on all sides. If you are into cookie jars then you must see the collection at the Cookie Jar Cafe. Hmm, I wonder if all of those cookie jars have cookies in them? Even though the Cookie Jar Cafe is really out in the middle of nowhere if plan on visiting on a Friday or Saturday night you must make reservations. Yes, it's that popular. 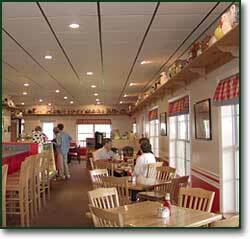 The Cookie Jar Cafe is just a small part of the Johnson Family Farm located in Dunlap Tennessee. 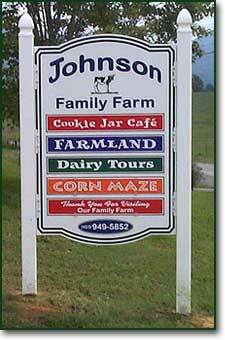 The Johnson Family Farm includes the Cookie Jar Cafe, Farmland (baby animals and antique tractors), Dairy Tours (tour the farm to see the process of how milk gets to the store), Corn Maze (a life size maze carved out of a cornfield...don't get lost). Now that you are probably hungry and ready to visit you need to know how to get to this outside of Chattanooga restaurant. Follow Hwy 127 north just past the underpass for Highway 111. Turn right onto Kelly Cross Road and travel another 1.8 miles. Turn left at the Johnson Family Farm sign. Follow Hwy 111 into Sequatchie County. Turn right onto East Valley Road and travel 1 mile. Turn left on to Kelly Cross Road and follow for .9 of a mile. Turn right the Johnson Family Farm sign. The country dining just doesn't get any better than the Cookie Jar Cafe. So make sure you stop in while you are in Chattanooga, Dunlap or just passing through central Tennessee. The Cookie Jar Cafe is the best Chattanooga restaurant that's not in Chattanooga. Don't forget to bring your appetite. Visit the Johnson Family Farm web site. If you are looking for a place to stay in or around Chattanooga Tennessee, we recommend you visit our Chattanooga Cabin Rentals page.